Having always been a fan of having various bits of greenery dotted around my house, this is not my first time dabbling with terrariums. That being said, I have never attempted to make one myself, I have always bought them or received one as a gift. I have a particularly beautiful one that my mom gave me last year which is still going very strong. Although the ones you can find in stores look great, there is a lot to be said for making your very own homemade terrarium. 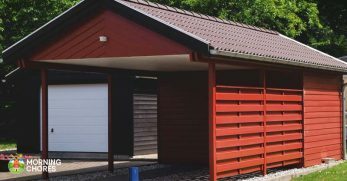 The beauty in this is that you can make it fit any space you want it to fill perfectly, and you can adapt it to your personal style preferences. By buying the necessary materials used to make most terrariums in bulk, you can always have them on hand to experiment with different ideas and whip them out as last minute, but lovely, gifts. 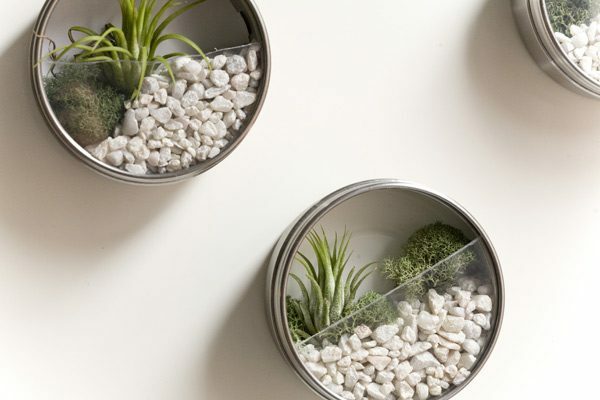 Whether you want to use your terrarium as a pretty centerpiece on a table, a little office pick-me-up or only as a creative decorative piece, there are many ways you can put your own spin on your mini garden. 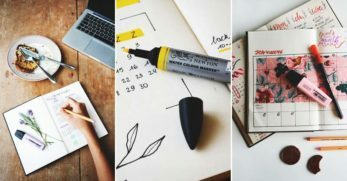 This DIY for a Lightbulb Terrarium comes along with a list of dos and don'ts for terrarium making in general, which is extremely helpful to have bookmarked for any projects you might be doing in the future. I like how small and dinky this terrarium is, and you could have a lot of fun choosing tiny plants to go inside it. 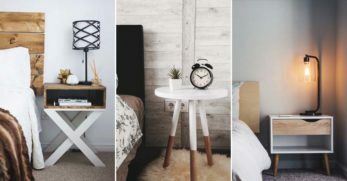 You can easily buy loads of different light bulbs in stores or online, of all different shapes and sizes, so that too can be a way of adding your style to this DIY. This terrarium, in particular, would make an excellent gift, as it is a little different to those that are readily available to buy. It would also look amazing sitting on a desktop, which I think is where I would be putting mine. Even though this terrarium is inside a Christmas ornament, I don't think that restricts its display to the festive season at all. 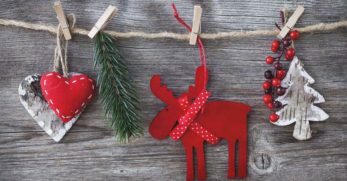 You could make it festive if you wanted to, by adding a ribbon or even hanging it on your tree, but at any other time of the year, it would make a lovely decoration for any space. Because of the shape, this Glass Ornament Terrarium might be a little bit fiddly to make, but the result would be entirely worth it. 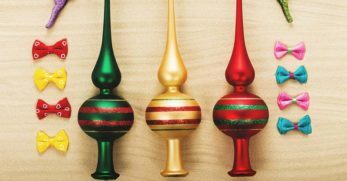 The spherical shape of the ornament makes it perfect for layering, so make sure to build up layers of different colors and materials when putting this one together. I think less is more with this DIY and one or two small, well thought out succulents will work best in such a small area. I feel like this Glass Bubble Terrarium is the classic shape that most people would immediately picture when they think of a terrarium, and it is a classic for a reason. Both its shape and size lend it to being perfect for making a little garden inside it. 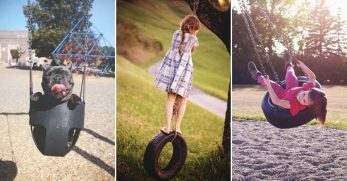 The spherical shape means that you can create different layers and play around with various heights within the bubble, and because it is relatively large it would make the perfect centerpiece or shelf topper. By using a container with a hole in the side, you reduce the need to be overly restrictive when choosing the size of the plants you put inside it. It also makes it far easier to water and maintain. 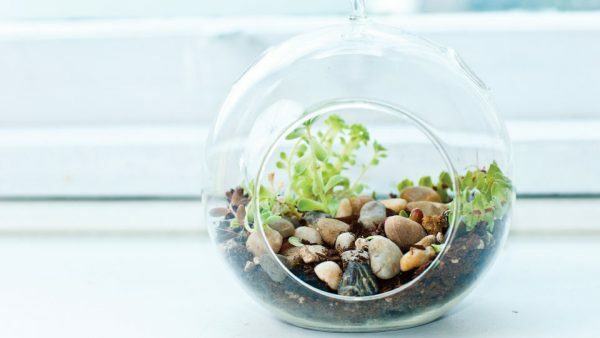 If you are looking for a very simple to put together terrarium, then this could be the perfect one for you. Once you had gathered together all the materials, this Bell Jar Woodland Terrarium looks like it would take you all of about ten minutes to make, although you would never guess that by how effective it seems. All of the elements within this terrarium come together beautifully, and I love the woodland theme. The mini clay mushrooms are adorable, especially with the red polka-dot tops, and would be a cute addition to any terrarium you were making. The use of a bell jar as the container for this terrarium is unique which I like; it makes it look fresh and creative without straying too far from the original terrarium concept. I never knew that a Mini Terrarium Necklace was something that I needed in my life until now. I can't say that I have ever seen anything quite like this before, especially not with real materials inside. These necklaces would make cool gifts, and I think they're even a great gift idea for someone you don't know too well because who wouldn't find these just adorable. Despite how small these little jars are, this DIY has still managed to achieve those perfect terrarium layers, which I find highly impressive. 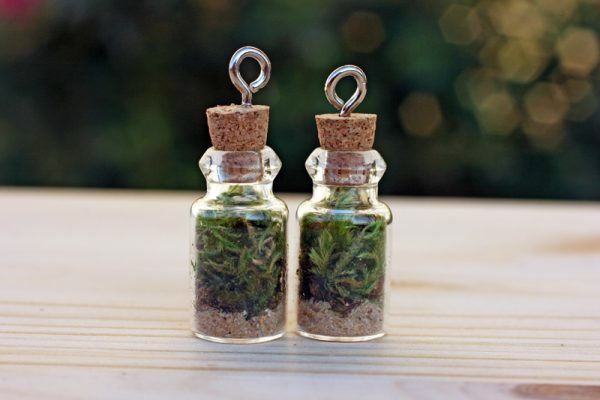 Even if you didn't want to wear this as a necklace all the time, a couple of the little jars themselves could make for some enjoyable, whimsical table decorations. Don't get me wrong I love it when a terrarium has a whole mix of different things going on inside it, but there is something genuinely satisfying about this Succulent Terrarium. I like that it is packed full of different species and colors or succulents, and the fact that there are few other elements means that the focus is solely on them. There are so many weird and wonderful succulents out there, so make sure to shop around and do a bit of research before buying. Although this is mainly filled with succulents, the addition of little pieces of sea glass is beautiful, and an idea I will be utilizing when making terrariums in the future. This idea is incredibly creative, and something that I haven't seen before which is always exciting. 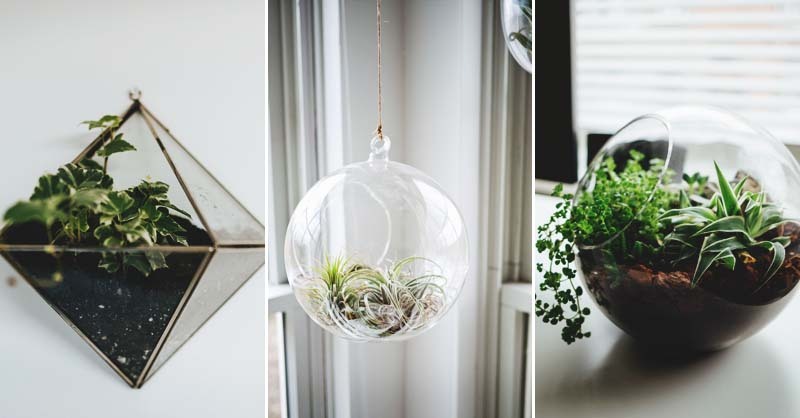 I like the idea of having a wall display with a mixture of these Wall Terrariums along with some pretty photo frames, something I think would make a beautiful feature piece in any room. These look simple to make and will last a long time, although I think it could be fun to change them up every now and again with different plants and gravels. 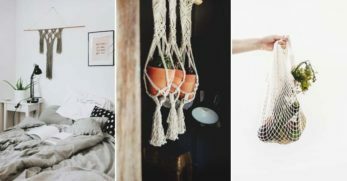 If you can be a little bit guilty of forgetting to water plants like me, then these would be perfect for you, just stick to air plants and you can admire them freely without the responsibility of having to keep them alive. 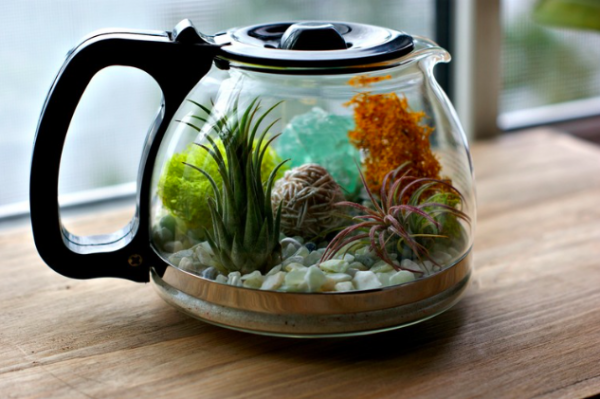 One of my favorite things about this Coffee Pot Terrarium is all the different colors that are present within it. Of course, this depends on what plants you use, and you could apply this to any terrarium, but it isn't something that I have seen often. 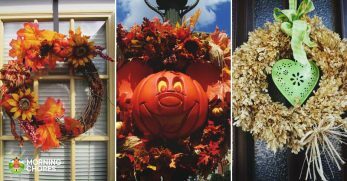 There are a couple of different materials used in this DIY, so you could chop and change them, playing around with different combinations and arrangements before you are happy with it. My other favorite thing is obviously the choice of container, which is highly unique and inventive. This has inspired me to think of other everyday household everyday objects that could be used to contain their own little garden. If given the opportunity, you will undoubtedly find me on a beach. A tropical beach where I can sunbathe, a cold Stoney beach where I can walk along the shore in a big coat, I'll happily take either. I have grown up making many fond memories at the seaside, so this Beach Themed Terrarium caught my attention straight away. This is entirely different to a classic terrarium in the way that it doesn't include any real plants or succulents, but the overall look of it is similar. 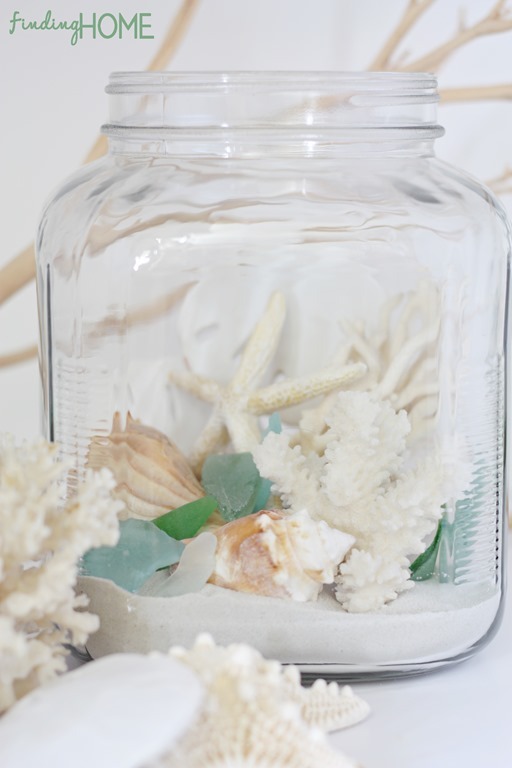 If you are set on having real plants in your terrarium, you could create your own surf and turf kind of theme, using a regular terrarium as a base and adding accents of the sea, like shells and sand. 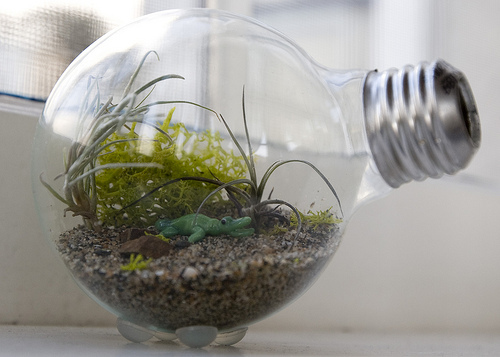 This isn't so much a full terrarium DIY as it is an idea for an element to put into any you might be making. Creating a waterfall to have as a sort of centerpiece in your terrarium is such a fun idea and one that I will be trying out. There are many ways you could make a Terrarium Waterfall, and you could improvise one yourself, but I love how surprisingly realistic this particular tutorial looks. It takes quite a few steps to achieve the final waterfall, but that makes it all the more something you can be proud of, and also leaves it entirely up to you to personalize it however you want. Paint the rocks whatever color you want, even add some coloring to the resin if you would rather have a blue waterfall. I am a sucker for anything mini, so these tiny Shot Glass Terrariums are an instant winner for me. 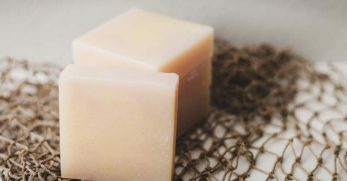 My first thought was that these could be lovely to label and use as little place markers at a dinner party, doubling up as both pretty decorations and a sweet gift that each guest could take home to keep. 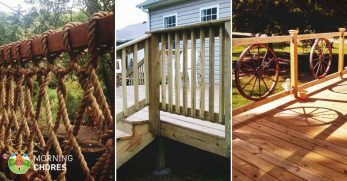 The instructions for this DIY aren't in English, but the pictures are informative enough in themselves to follow and replicate. By changing the size of the glass, you use you could easily pick what size you would like your terrarium to be, from a tiny little shot glass to a larger tumbler style drinking glass. These teeny tiny succulents are just too cute to leave. 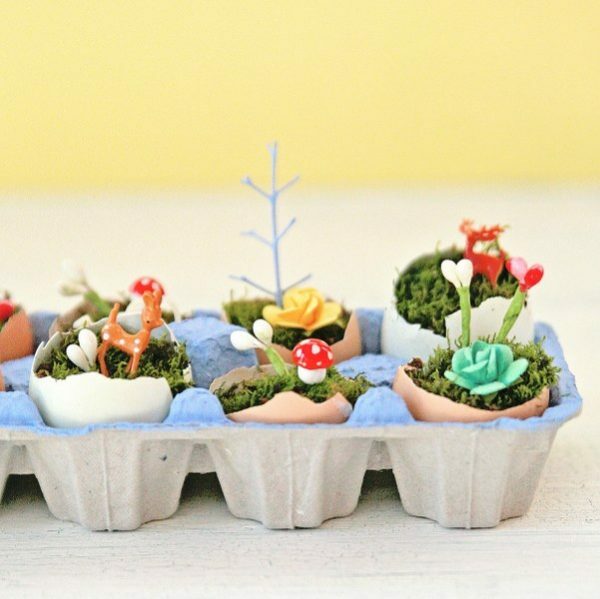 These Egg Shell Terrariums would be a nice craft idea to try out with kids, especially with those sweet little animal figures they have used in this example. 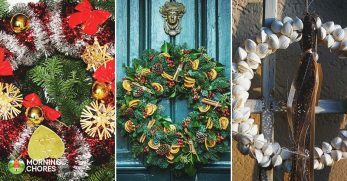 You could be creative with the materials you buy to decorate these small gardens with, like pipe cleaners to make into flowers or even some glitter to make them fairy themed. I am not sure how long these would last, but that doesn't matter considering how fun they look and how inexpensive they would be to make. They look best being kept all together in this egg carton; it's like a little community of terrariums. 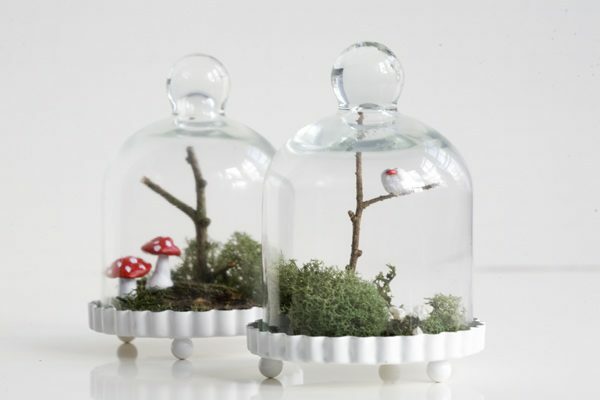 There are probably people out there who could scroll past these Thimble Terrariums without experiencing a strong desire to make a whole batch of them right that second, but I am most definitely not one of those people. 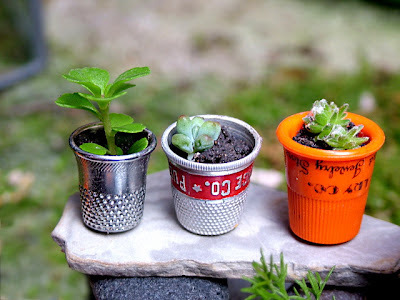 I think this desire comes again from my love of miniature things, and the size of the succulents required to fit into these thimbles is just adorable. This DIY has gone as far to make an entire mini greenhouse; I am not sure how or when I would ever use that, but I am desperate to make it nevertheless. 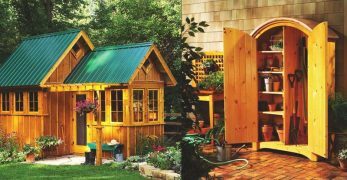 These would also be a beautiful thing to prepare for a kids' doll's house; I know that I certainly would have loved to have a couple in my dollhouse when I was little. 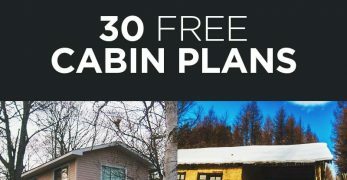 This is a unique idea, and one which I think has been executed exceptionally well. 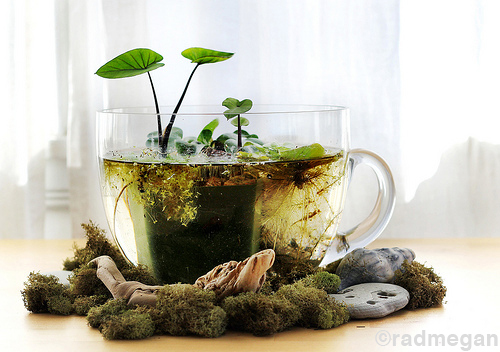 It would have been easy for this Water Terrarium to look like some moss in murky water, but by having different levels of plants and having some additional elements around the bottom of the cup, the creator of this DIY has made something beautiful. 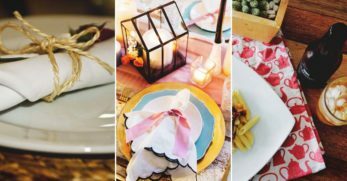 If you are looking for a table centerpiece which could also become a topic of discussion, then this could be perfect for you, as everyone who sees it is likely to be intrigued. The most expensive part would be purchasing the cup or container, so if you already have one lying around that you could use, then you are in luck. I already have a couple of hanging terrariums dotted around my house, but I will admit that they are not real so they could be doing with a bit of an upgrade I think. 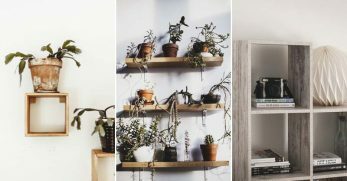 The beauty of hanging plants is that you get the feeling of fresh greenery in a room without having to find space for it, making them perfect for smaller rooms or apartments. I love the idea of having a cluster of these Hanging Globe Terrariums at different heights above my desk, and this would give the entire room a bit of a lift. If you were making a couple you could play around with different styles, plants, and materials, creating your own kind of terrarium jungle. I always see these Geometric Terrariums in stores for ridiculous amounts of money and am still tempted to purchase one. I just love how stylish they are, and the fact that they are sleek and clean while still being something cool and exciting looking. 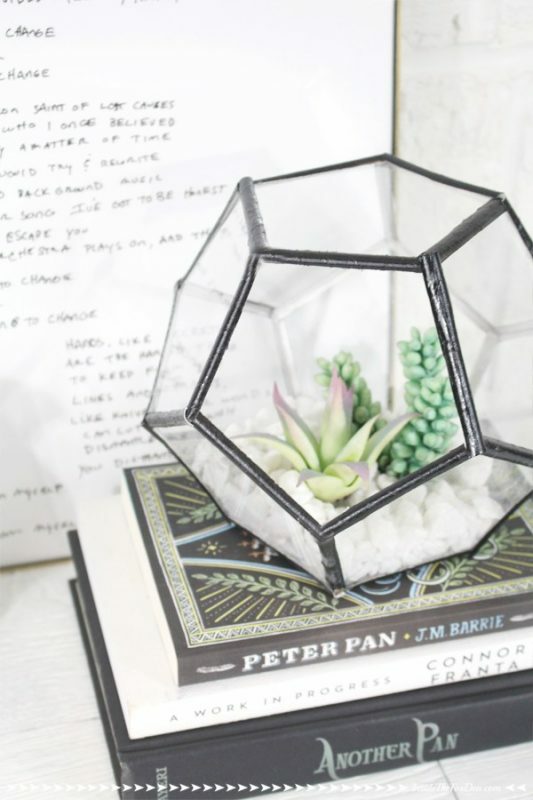 By using a geometric container for your terrarium, you're also in a great place for creating lots of lovely layers, as the shape lends itself perfectly to building up different heights and materials. 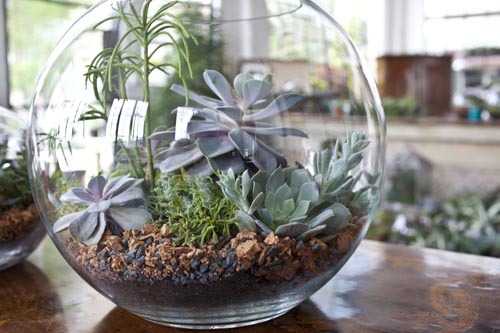 It is also incredibly handy that this terrarium will look just as good from every angle, so you could use it as a coffee table centerpiece without worrying that there is one side which doesn't seem quite as good as the rest. The sunset effect that the skilled layering of different sands gives to these Colored Sand Terrariums is beautiful and sets them apart from other terrarium styles. The overall concept is the same, with the sand, soil and stone bases topped with succulents and other decorations, but I feel that the colors take it to a new level. 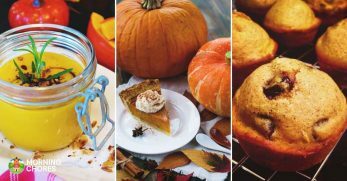 You could experiment with hundreds of different color combinations, opting for similar ones like yellows and oranges or going completely crazy with every color of the rainbow. 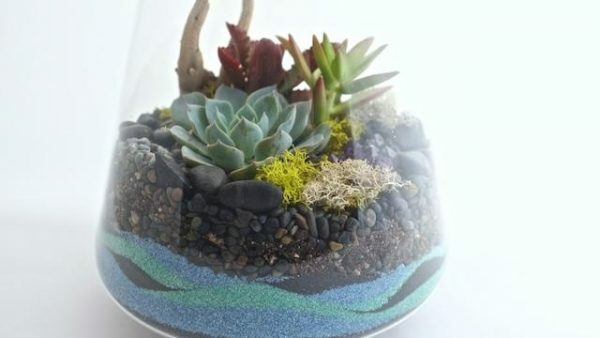 I like the blue and green tones used in this specific example because they perfectly tie together the colors of the sand on the bottom with the colors of the succulents on the top. 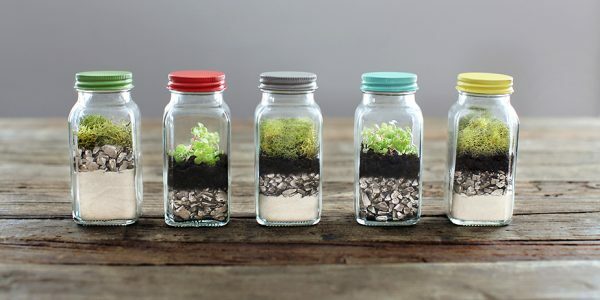 You can't go wrong with a good mason jar craft, and this Mason Jar Terrarium is no exception. With that said, you wouldn't have to use an official mason jar for this DIY; any glass jar would do. 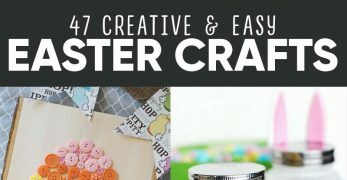 In the past, I have very often used old jars for pasta sauces or pickles for these kinds of crafts. These terrariums are slightly different to a lot of others because of how full they are. Very often you will see terrariums with one or two layers of base material on the bottom, topped with plants and then a large open space. 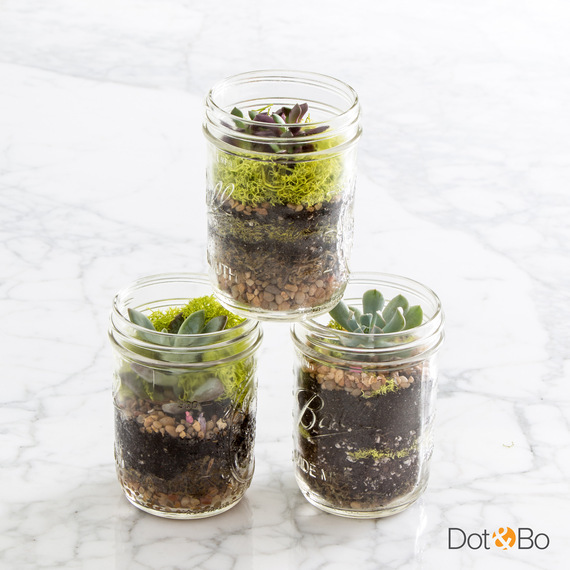 In this DIY, however, there are many layers on the bottom, almost filling the jar before the succulents are placed on top. I like the effect this gives and think these would look especially good up on shelves. What an excellent way to give your old fishbowl a new lease on life. I had a goldfish when I was little, and considering how often I forgot to feed it and would leave it up to my parents I bet they wished they had bought me a terrarium in a bowl instead. 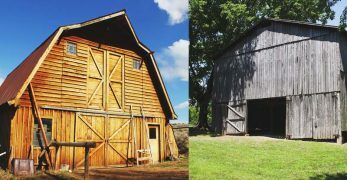 In this example, they have used a burnt orange colored gravel along with the darker one, which I think creates a charming effect, and gives it a bit of depth as opposed to being entirely flat. I would like to have a Fishbowl Terrarium like this on my desk where I work, and maybe another in the middle of my coffee table. 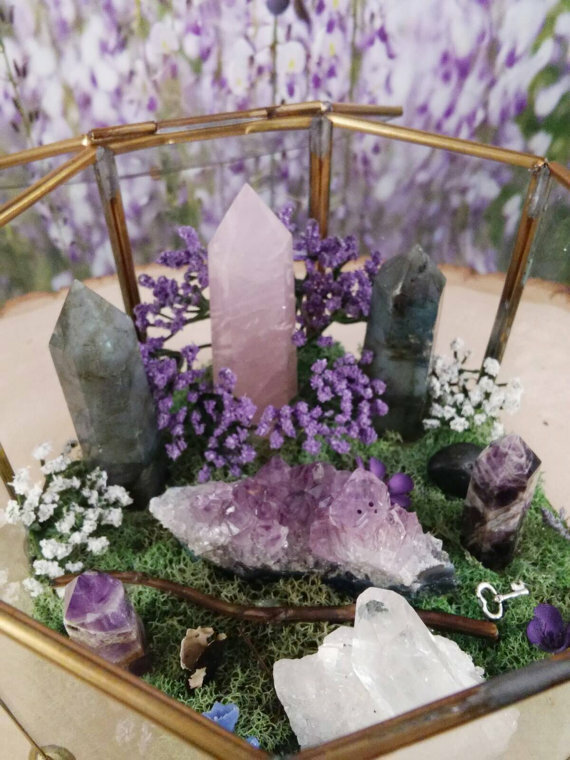 Adding geodes to a terrarium takes it up a level from an indoor plant to a display piece. You could be as discreet or as heavy-handed as you like with the geodes, using one or two smaller ones in amongst multiple plants or having one central succulent surrounded by sparkling geodes. 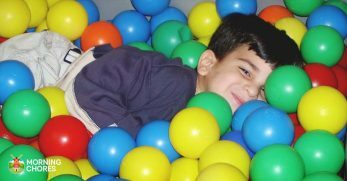 You can find the materials necessary to make your Geode Terrarium in many stores, or even more easily online. Geodes are available in many colors, shapes, and sizes, and they range from the subtle to the dazzling. 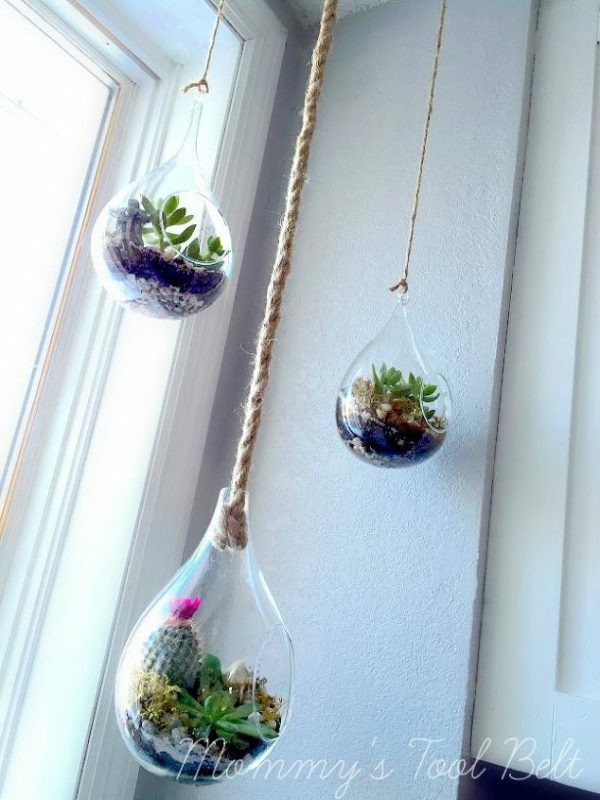 This idea won't be a hit amongst everyone, but I love it and think it's a great way to elevate the appearance of a terrarium. 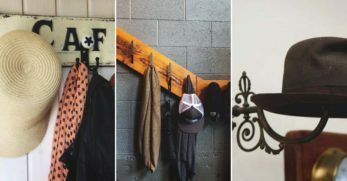 Any DIYs which involve either up-cycling or re-cycling get a bit thumbs up from me. I have been majorly cutting down on the waste that leaves our house, but there are little things here and there that can't be avoided, the odd soda bottle being a perfect example, so I like having ideas like these up my sleeve. 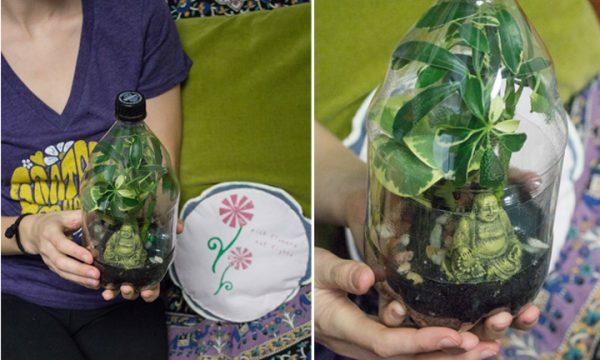 When I first saw this Recycled Soda Bottle Terrarium, I thought that the contents could only have made it inside of the bottle by pure magic and that I would never be able to achieve such a thing. Luckily, you cut the bottle open and fill it with lots of loveliness before neatly putting the parts back together, so no one ever notices. This isn't exactly a small DIY project that you could do spontaneously on a rainy afternoon, but that does not make me any less desperate to make it. 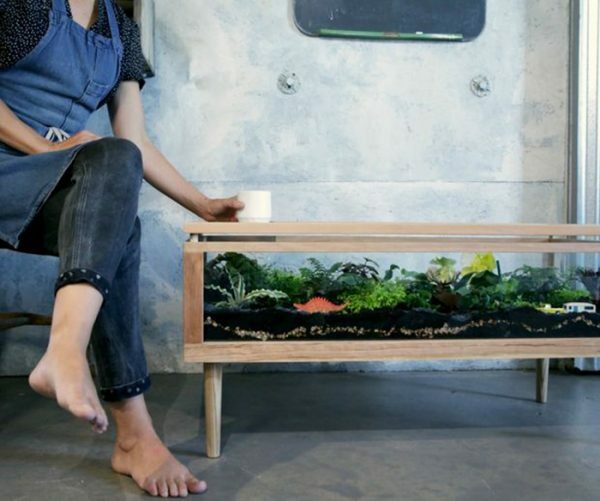 I have never seen a Terrarium Table before, but I think I need it. Now that I have seen this I will never be able to look at my plain old coffee table with any loving feelings ever again. 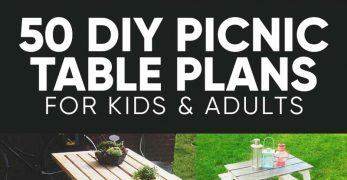 Assembling this DIY would be incredibly fun, and you could spend hours getting it perfectly planned out with exactly what plants you want to use, what you will use to create your base layers and any kooky little extras you might want to add along in with it. 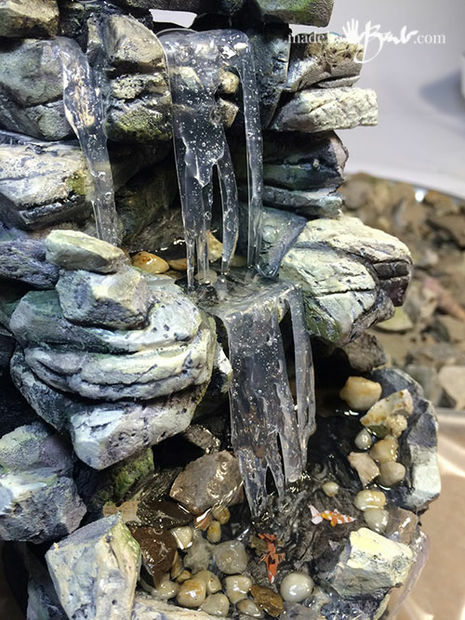 In this example, they have used some plastic figures which you could get creative with, but you would also utilize different DIYs to add even more elements like a waterfall or pond, and maybe a couple of geodes here and there. Having a collection of these Spice Jar Terrariums all lined up neatly on a shelf would be a lovely quirky addition to a room. I even think it could look cool to have these in a kitchen arranged in an alternate line with regular spices. The lids look so much better painted than regular ones do, I think I might be applying this to all my spice jars. The perfection of the layers that the creator of these terrariums has managed to achieve is admirable, and I think that is part of what makes them so visually appealing. The contrast between the almost monochrome sand, soil and pebbles and the bright green plants and colored lids makes them look sharp and sleek. One or two of these Lantern Terrariums would look stunning on a bedside or coffee table, especially in an otherwise monochrome room if you were using gold lanterns like in this example. 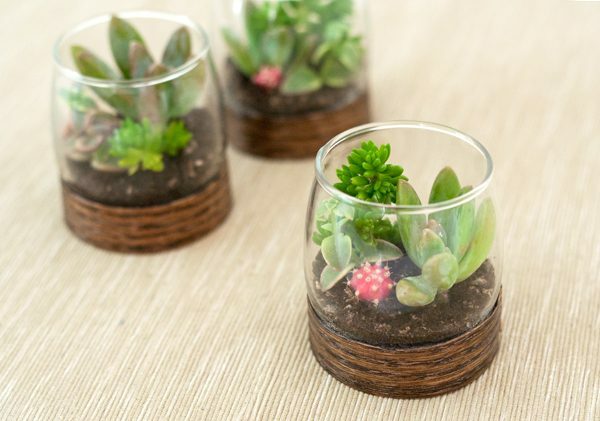 This particular DIY uses faux succulents, which is a good idea for if you want something that will last forever and that you will never have to worry about up-keeping. It would be easy enough to use real succulents if you would rather, just be sure to have them adequately planted in soil at the bottom of the lantern. 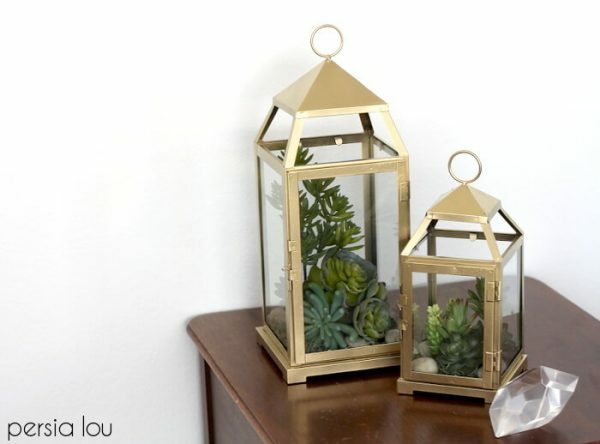 Because of the gold, I think these terrariums look slightly more decorative and elaborate so that they would be a perfect feature piece in a room. 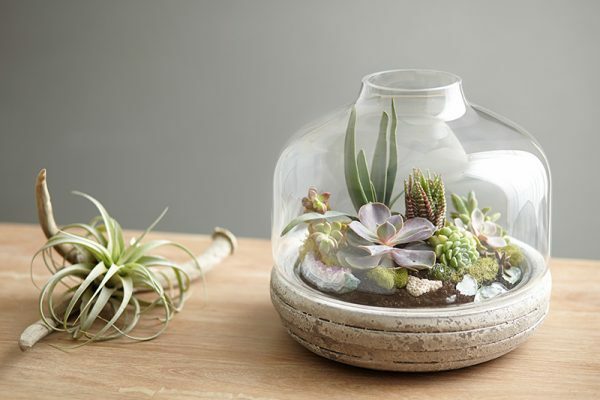 Not everyone will be a fan of these Miniature Scene Terrariums, but I think they are a good bit of fun. 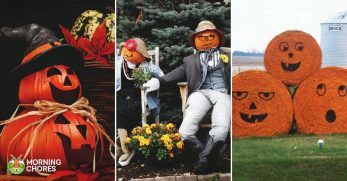 If you were having a themed party these could be a fantastic way to decorate, and something you can keep as a souvenir for years to come. Of course, you could take inspiration from any of your favorite books or films, but I have fallen in love with this Alice in Wonderland design. Because that story is renowned for being wonderfully whimsical, it works perfectly in this mini garden world. Kids' toy shops are probably the best places to look for mini themed figurines, and in my opinion the zanier you go with this one, the better. After realizing how many easy to follow, creative DIY terrarium tutorials are out there, I have decided that it is most definitely time to get rid of those fake terrariums I currently have around my house. If I can make my own, exactly how I want it, for a similar or lesser price then why ever not? I would love to decorate my desk area with a couple of the Hanging Globe Terrariums, and think I will be adding some geodes in there too. 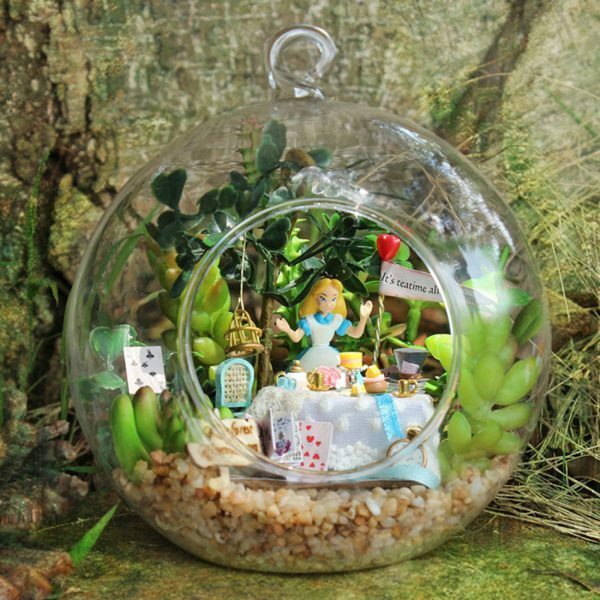 One of my princess-obsessed little cousins has a birthday coming up, and I just know she would go mad for a Miniature Scene Terrarium featuring her favorites, so I might just have to make one up for her. 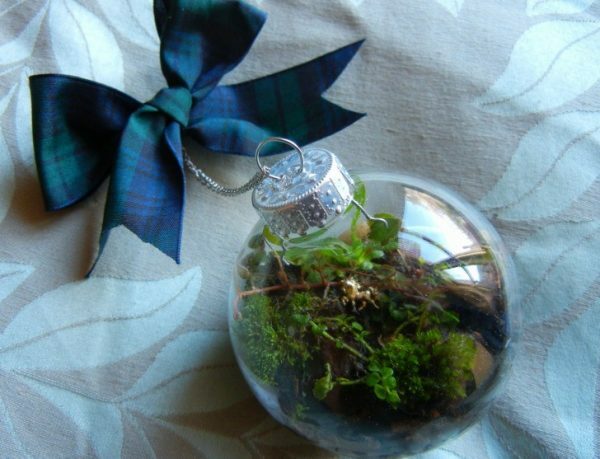 Is a terrarium something you would like to receive as a gift? Have you ever tried to make your own? Let us know in the comments below, we love hearing from you.